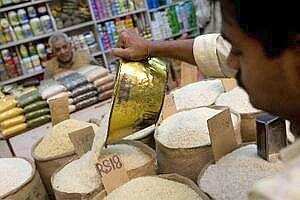 New Delhi: Food prices in India have surged again, rising more than 11% year on year, according to weekly inflation data on Thursday. The Reserve Bank of India has raised rates 13 times since March last year to try to tackle inflation, raising the cost of borrowing and leading to complaints from business leaders about a slowdown in demand. The new food inflation rate of 11.43% in the week ended 15 October was much higher than the previous week, when it stood at 10.60%, according to figures from the government. The increase was due to rises in the price of vegetables, fruits, milk and protein-based items. Food inflation has been high in India for much of the past two years, peaking at around 20% at the end of 2010.